Recent construction,very peaceful,real countryside, surrounded by olive trees. The most important culture sites as Montecatini, Pistoia, Vinci, Lucca, Florence..ecc., can be joined in less than one driving hour. The owner will be glad to help you in any of your questions. For those who like to taste some typical plate, the owner and professional chef Claudio will be glad to cook for you - on request - once personally! We have just had a terrific week here, we are a family of 4.
we pictures do not do this house justice-we would happily stay here again. The pool, the wonderful outside seating either at the table or comfortable sofa style chairs all great. the location is all very near, great couple of local restaurants and a good sizes Coop. close to Pisa, Lucca and Florence. Claudio was very attentive before and whilst we were there via text making sure everything was ok-thank you! thank you so much for your great comment and of course, we are glad you enjoyed your stay at the Cappero. We would be very happy to meet you in the near future! 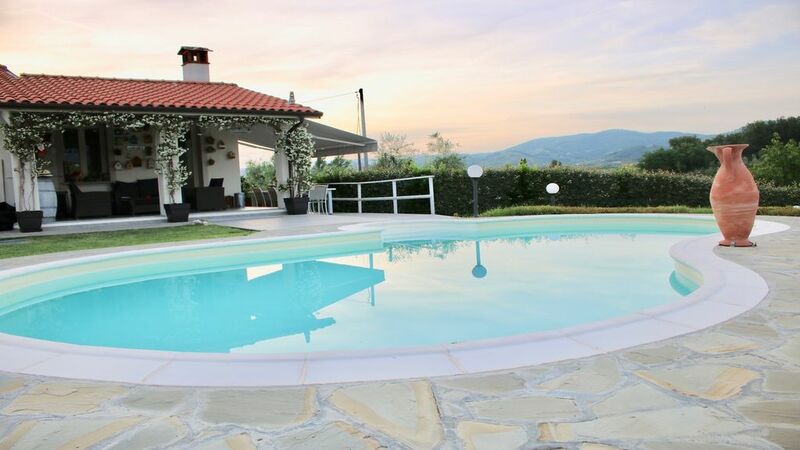 Modern house in superb Tuscany location! Fantastic house in great location close to a small town with restaurants, gelateria and supermarket. The house is modern, in very good condition and is kept in top shape by owner Claudio. The kitchen is very well equipped and has an incomparable view. There is a lovely patio to rest in the shade or enjoy in the evening. The beds are soft and comfortable and there are AC in the bedrooms so you sleep very well. The house is divided into two parts so it was completely trouble free to share with our friends we traveled with. The roads around are perfect for a morning run and if you want to challenge yourself, take aim at the Castello! Claudio brought brand new bikes during our stay for tenants to borrow. The location is perfect with Florence, Pisa and Lucca close by and we can also recommend to go to La Spezia for a boat trip to Cinque Terre. One evening, we had a cooking session with Claudio who taught us to make pasta and cooked a wonderful dinner - a very nice experience! Claudio and Paula are wonderful hosts and they make sure their guests are enjoying their holiday. Many thanks for this lovely week! The location of the villa is very central to visit Tuscany. Vinci with the Museum of Leonado, Firenze for which we took a direct and 20 min train from Empoli and the wonderful Sienna. We have enjoyed our stay in the villa, we were 8 of us (big family gathering) but we never were on top of each other as very practical as the house is split in 2 levels. Very well equipped, a feeling of a home from home. On our last night, we went in the restaurant Bonefaniti in the center of the village, just a stroll away from the villa, where we had a great meal! Wir hatten einen wunderschönen Urlaub. Neben dem tollen Haus, das im übrigen noch besser als dargestellt ist, können wir die liebenswerten Gastgeber hervorheben. Die Lage ist perfekt für Ausflüge zu den Sehenswürdigkeiten der Toskana. Wir werden mit Sicherheit hierhin wieder kommen. Traumhafte Lage, gepflegte und super ausgestattete Unterkunft inmitten der Toskana! Der Aufenthalt im gepflegten und toll ausgestatteten Haus war Urlaub von der ersten Minute an! Die Gastgeber Claudio und Paula sind unglaublich hilfsbereit und freundlich! Unbedingt empfehlenswert ist ein vom Gastgeber angebotener Kochkurs! Toskanafeeling auch in der Küche und auf dem Teller! Besser geht es nicht! Herzlichen Dank für die nette Bewertung! Wir freuen uns, dass es euch gefallen hat! Heel fijn huis en super vriendelijke en behulpzame eigenaars. Met het gezin gekookt met eigenaar Claudio. Ideaal gelegen om Firenze te bezoeken. thank you for your nice comment, we are glad, that you had a good stay at our house!